Parishes in the Diocese honor catechists and aides in various ways; some will have a special ceremony as part of the Mass, some will sponsor a lunch or dinner, and some will present the catechists with a small token of appreciation. These types of celebrations are vital as a sign of witness to the parish and diocesan community; these catechists serve as model witnesses for others. A challenge for most parishes is to identify a sufficient number of individuals who can serve as catechists. By definition, a catechist is one who mirrors Christ to others. In the catechist, we see the reflection of Christ alive and well. Catechists are not only teachers, but are witnesses to the Good News that Jesus is our Lord and Savior. As witnesses, we have the responsibility to share with others the Good News. However, catechists need special training and ongoing support. New online training is available that makes volunteering to be a catechist a bit easier. We are grateful that the work done in recent years throughout the Diocese in Brooklyn and Queens has brought people to the Faith and kept people in parish programs of religious education. Participation in our formation program for catechists and catechetical leaders, Living and Leading by Faith, continues to grow every year. More than fifty percent of our parish programs of religious education show an increase in the number of students receiving instruction. There is a constant need to attract more enthusiastic catechists with a desire to be witnesses for Jesus Christ. Various models of programming for religious education are now available throughout the Diocese, making use of the best methods available. 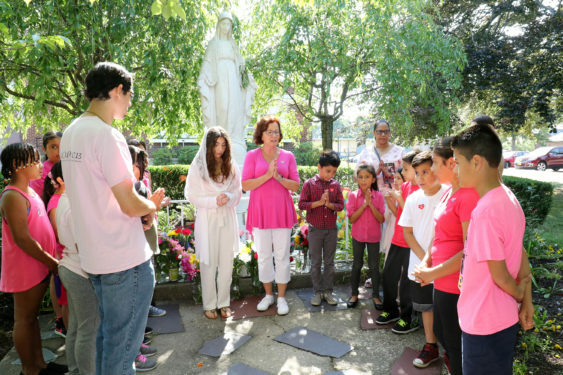 The regular weekly student classes that have been the norm for many years now are giving way, in some parishes, to programs that meet once or twice a month involving the whole family in some cases. Other options include home study using approved online resources combined with parent interaction and group gatherings at the parish. Major Church documents tell us that the first and primary educators of children in the Faith are their parents. Enabling parents to fulfill their responsibility, in this case, is a priority for the Secretariat for Evangelization and Catechesis, and several initiatives to support this priority will be available within the next few months. Strong Catholic Families, Why Catholic, So be BOLD! and Dynamic Parish are just a few of the resources available. The work is increasingly challenging because, in many cases, the family structure has been weakened. We need to do everything possible to strengthen family participation in religious education. Pope Francis spoke to the families in these words, “God wants every family to be a beacon of the joy of his love in our world. What does this mean? It means that we, who have encountered God’s saving love, try, with or without words, to express it in little acts of kindness in our daily routine and in the most hidden moments of our day.” (Saturday, 25 August 2018 – Croke Park Stadium, Dublin). In other words, we need to be witnesses in a world that needs a new springtime of God’s love. I recall the wonderful gathering at St. John’s University this past April where the Papal Nuncio to the United States of America Archbishop Christophe Pierre, at the end of his keynote address to those gathered urged us to “BE BOLD!” He challenges us as a diocese to put out into the deep (and he used these words) tasks of the New Evangelization. So that all those who want to learn more about our Faith will have the opportunity to do so, we need to support and encourage those who have been called to be catechists and catechetical leaders. We also need to pray for all parents and grandparents, aunts and uncles, brothers and sisters who are called to be witnesses for Jesus Christ and serve as catechists by their baptismal call. I urge you to put out into the deep and take advantage of the many events and courses offered by the staff of the Secretariat for Evangelization and Catechesis available throughout the year. Consider volunteering to be a catechist. Go to www.bqonlineformation.org and www.meetmein.church for more information.